In Episode I of this late 2014 Camera Price Charts mini-series, we took a look at the 35mm Full Frame Cameras. In Episode II, we focused on APS-C DSLRs. In this episode, Episode III, we focus on the wild world of Mirrorless cameras. To see the charts at a bigger size, “View Image” in browser. 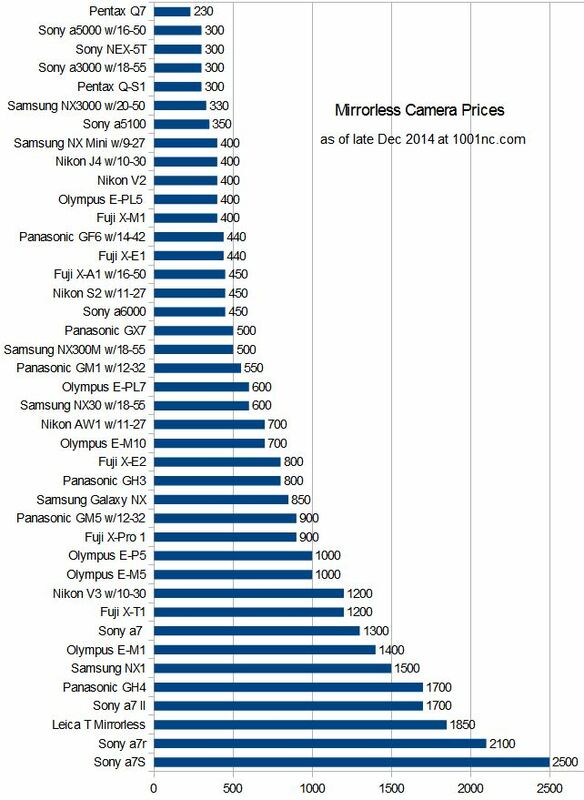 The prices are a consensus price between B&H Photo and Amazon and Adorama as of December 30 in 2014. These are new condition with USA warranty prices, from authorized dealers (iffy and unauthorized dealers selling at Amazon are ignored). In the first and second charts, prices are the body only prices with the exception of cameras that are not available as body only kits. The last chart is a comparison of “Getting Started With” kits (lens is included). Older cameras that are no longer available in new condition with USA warranty at the above retailers as set forth in this paragraph are not included (for example, Canon EOS-M Mirrorless, Pentax K-01 mirrorless and such). None of these have mail-in rebates. For a small number of these mirrorless cameras, finding a consensus price was not an easy task, with various colors and lenses and options/kits. You can find these in the footnotes at the bottom. We start with the flagship prices. As you can see, we have a diverse set of sensor sizes among the flagships, from 35mm full frame to 1-inch for the Nikon mirrorless. At least in the eyes of the camera manufacturers and the photographers who buy them, you don’t have to have a giant sensor to be a flagship camera. The Nikon V3 does not have an official body only kit, that’s why you see the V3 w/10-30mm. I had a hard time considering any of the Pentax Q-series cameras as flagships, so they were not included in the flagship chart. Leica Rangefinders are not included in this chart (they are without mirror, but not a made-for-digital mirrorless system), but you can find them in chart #2 of the 35mm Full Frame cameras. Here comes the Mirrorless Avalanche! From the tiny 1/2.3″ sensors to the 35mm full framers and everything in-between, with a full order of magnitude in prices, from $230 to $2500. As mentioned above, the prices of the body only kits are included, except for cameras that don’t have official body only kits. This chart is very long as it is, having multiple entries for each camera would make it very looong. For this exercise, I tried to pick consensus prices instead of the absolute lowest, so cameras with significant divergence in their prices are mentioned in the Footnotes. As you can see, sensor size is no longer a big factor in determining prices. 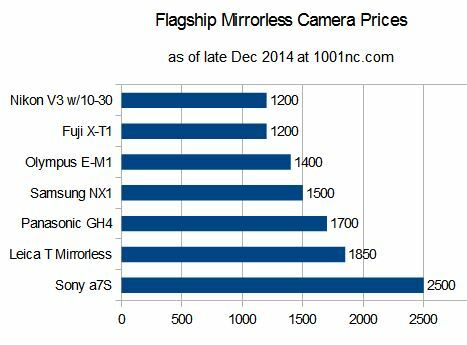 Sony and Samsung have multiple cameras with lower prices than cameras with smaller than APS-C sensors. Pretty much every non-boutique mirrorless system offers at least one affordable entry-point price. As I did in the APS-C dSLRs, I also created another chart with “take pictures with” kits, official camera kits with lenses included. 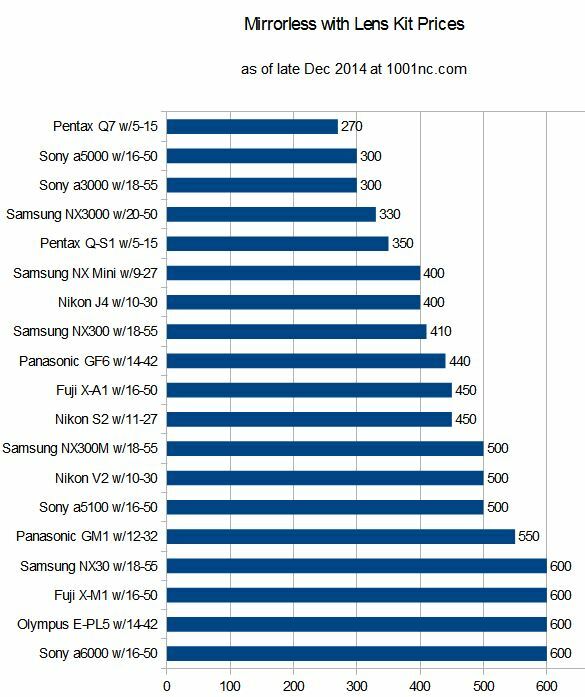 The focus of this chart below is the entry-point into the various systems, that’s why you don’t see most of the $600+ cameras included.